Many of our families initially hear about All Saints through a personal referral from an existing school family. Now we want to reward you for promoting our school to your family and friends! 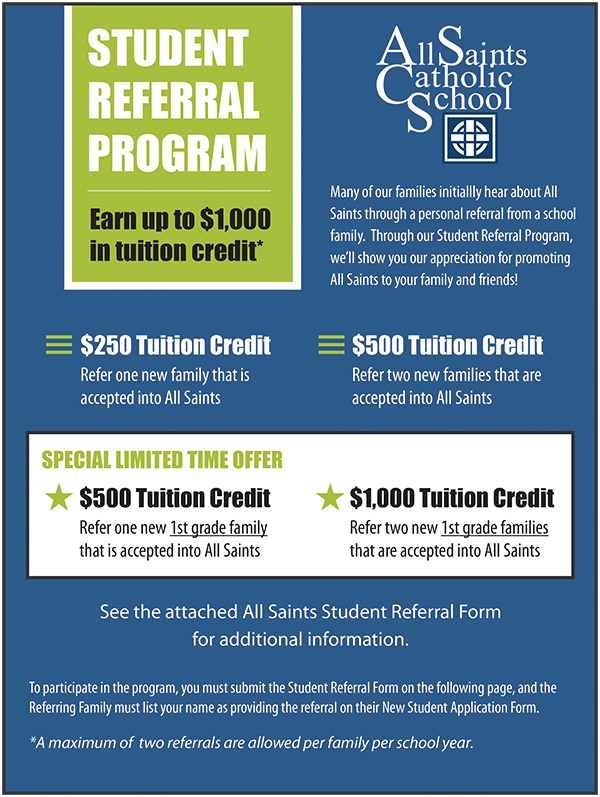 Through our Student Referral Program, your family can receive a $250 tuition credit for referring one new family or a $500 tuition credit for referring two new families. Now for a limited time, you can receive $500 for referring one first grade student and $1,000 for referring two first grade students to our school! For more information about our New Student Referral Program, please download our New Student Referral Form. Help us spread the word about the success and tradition of All Saints Catholic School!